Throat Blog — Would You Like Some Isotopes with Your Barium? Well, I wasn’t actually given a choice about that, but I did get to pick between Berry Barium or Mochacino Barium. I opted for Berry. Meh. The isotope injection actually had more flavor (I could taste it about 5 seconds after it started going into my arm). Throat Blog — What Insurance? Well, I have insurance through work. But, they have not yet approved the surgery. So, assuming this is still the case, tomorrow, I’ll have to sign a waiver saying that I’ll take full responsibility for the bill. Yikes! My office stepped up and contacted folks to get a # for expedited approvals. Either way, I’m having the surgery. I just might go from ER to ICU to room to rehab to the poor house. I’m not that worried…we’ve just been moving faster than the speed of insurance bureaucracy the past few days. They’ll catch up. Ok, I just titled this entry like that because it sounds deep. In reality, as I told a friend a few days ago, the closer I get to surgery, the more I want to keep to shallow waters. There is a raging torrent just below the surface, and I am fighting to keep from dwelling there. I know we are all sitting around refreshing so here is the latest update. Today turned out a little different than we all thought. The procedures completed today include a microlaryngoscopy and bronchoscopy. Both of these are accomplished with a scope and are non-surgical. They took approximately 1 hour and the purpose is to take some biopsies and visualizations. Tomorrow there will be a meeting with the “tumor conference” to work on next steps. The diagnosis officially changed from sarcoma to squamous cell carcinoma. Sounds like surgery is still a possibility for removal. Additionally, chemo and/or radiation treatment are anticipated. The PET scan showed no sign of metastasis which i believe is a good sign (even though I am far from being a doctor). Paul will go home today as well. Ok, to start, a short story. Before I tell it, though, I must say that I wrote the story before I met 2 of the 3 doctors I saw today. Any resemblence to any doctor, living or dead, is purely coincidental (and, in my case, actually there is little resemblence…but don’t let that detract from the story itself). A Medical Oncologist (i.e. chemo doc), a Radiation Oncologist, and a Surgical Oncologist all go in together on the purchase of a fixer-upper. They all three go to check it out and decide on the best course of, well, fixing it up. The Medical Oncologist looks around a bit and says, you know, if we just strip the floors, put in some aromatherapy, and set off a bug bomb or two this place will be just fine. The Radiation Oncologist looks around and says, you know, all this place needs is better lighting. Lets just put up some strategically placed high-intensity spotlights. The Surgical Oncologist looks around and says, well, I think we are just going to have to take everything out of here. And, while we are at it, we should move the front door closer to the bathrooms. Ok, now for my real tale which really didn’t go as the above might suggest. The Medical Oncologist was first. He went over all the options from his perspective, including his thought that ultimately the major surgical option might be the best way to go, but that he was open to starting with a more conservative therapy. We spent the rest of the time discussing the roadmap in the event we went more conservative. Basically a chemo cocktail every 2-3 weeks while simultaneously getting radiation therapy every week day. He didn’t expect that nausea would be any issue for this kind of chemo, but that the radiation might start making me feel bad after the first month or so. Next up was my Surgical Oncologist who did the biopsy yesterday. He also said that long term, a complete laryngectomy was more than likely, but that he would completely understand and support starting with chemo-radiation while still watching to make sure that there were no issues that would take that option away. The Radiation Oncologist actually spent more time talking about the risks of not having the surgery in general in terms of long-term prognosis. However, the increased risk, in the aggregate of patients, is not huge (like in the 5%-ish range). I have one bad thing feeding this: the tumor is large. However, balanced against that is that my general health is excellent, I have no breathing issues, I have no issues swallowing, I’m not obese, diabetic, or a present or past smoker. All of those would make chemo-radiation virtually a non-starter. Restoration of voice and continue to have a mouth/nose airway. No natural voice (beyond whisper) and continue to have a mouth/nose airway. The first two are only possible without a full laryngectomy. The third would be the result of the full laryngectomy. Even without the laryngectomy, my voice might never restore. The anchor point of my vocal ligament on the thyroid cartilage seems to be missing. But, maybe not. It is not easy to tell. A total laryngectomy would be a huge quality of life issue. It would restrict my activities quite a bit in ways that I really, really don’t want to be restricted. I know that this is creating a big bias affecting the decision to take a bit more risk. In the end, I’ll either regret this or not. I’ve decided to proceed with chemo-radiation. I should be able to return to work, but will be out at least 2 hours a day every day for treatment (chemo days I’ll be out all day, as it is about a 5 hour process). Two-three months of treatment, then we’ll see where we are. We might be right back to laryngectomy. Meanwhile my chemo doc told me to fatten up. Later on, if I am queasy, I’ll need that energy. So, trying to eat 3 squares a day. I should add that the above is a really condensed and biased synopsis of 3 meetings, each of which lasted 45 minutes to an hour. Which was pretty phenomenal considering I was basically a “walk-in” to all three. All the doctors said much more than what I’ve decided to relate, above, and I am sure I’ve skewed some of the details a bit. I recorded the meetings so that I could go back and review them (in lieu of notes), but didn’t have 3-4 hours tonight to do that. So, trusting to untrustworthy memory based on biased listening for this post. I might have gotten some of this wrong…blame it on me, not on the doctors. They were all great. 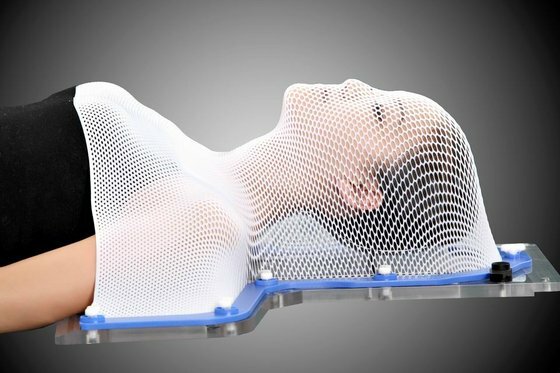 Tomorrow I go in at 7:30 am to be fitted for my head shield (cat scan of my head and upper torso so the shield can be prepped to my exact size). I’ll also meet the Radiation Oncologist’s research team (I agreed to participate in a trial that reduces the exposure of surrounding tissue to the radiation while keeping the same concentration of radiation on the diseased tissue). A possible benefit of the trial methodology would be less damaged tissue in the irradiated area in the event a laryngectomy is still necessary. We’ll also have to see what happens as the tumor retracts from the areas of the thyroid cartilage that is affected. It could recalcify, develop hardened scar tissue, or just leave a hole. Hoping for one of those first two, as the third points back to laryngectomy. Also, the thyroid glands themselves are going to be, in the doctor’s words, toast. I’ll need to take thyroid supplements, but he said that is a well-developed protocol. Even with all of the above, I’ll say again that all three doctors said that total laryngectomy is still quite likely even with successful chemo-radiation. No minced words. My hope does not equal either diagnosis or prognosis. So, I’ll whistle past the graveyard while I can still whistle. Ok, enough for now. I need to finish my dinner before it gets cold. Tomorrow is another doctor day. I went to the radiology center at UTSW early this morning to be fitted with my head cage. Actually, it is what will hold me very still during the radiation treatments. They laid me out on the CT scan table, then put the warmed mask over my head and upper torso. As it cooled, the material hardened, shaping itself to me. Then the fun started. Since the biopsy I’ve been having to clear my throat a lot. I had not really cleared it well before they laid me down…and I didn’t realize that I was about to be locked into place. A bit of panic, as I could not clear my throat and started to feel like I was going to drown. So, they unsnapped me and let me sit up and clear. They assured me that I am not the first person to have that reaction. I had cleared my throat so didn’t get the drowning feeling. The mask had cooled and I had expanded a bit so I had room to move my throat enough to at least swallow, if not cough. Made it through the procedure fine after that. I was worried that I’d have to valium up (and then I would not be able to drive myself back from the appointments). So, past that hurdle. I think they took about 30cc of blood for testing. And, now I have an appointment set up with an oncological dentist in Garland (only 2 hours from my house) for next week. I get extra fluoride during the radiation treatment. Any conspiracy nuts out there beware: Because of the extra fluoride I will, of course, be extra trackable by government black-ops teams. Treatment starts on 10/2. I have a couple of other appointments between now and then (chemo, speech therapist to discuss swallowing, aforementioned dentist, etc.). And, I need to eat everything I can, and continue to do so even once the throat starts hurting. Actually, my throat is pretty sore, today, from the biopsy, but that should go away in the next few days. They said that the sore throat from radiation would be much worse…probably my worse symptom. If they see me losing weight, or if it starts to seriously affect my ability to swallow food and liquids without choking they’ll put in a feeding port. So, an incentive to not lose weight. Gotta stock up on Ensure and make sure my blender is in good working order. Ok, that is it for today. I’m going to stop by the office then head home. I think I’ll probably start back to work tomorrow, only leaving for my various appointments. What a change since Tuesday morning when I faced weeks in the hospital and months recuperating. I might still face that, but I’m fine with just putting that out of my head for now. So, no real news, today. I have some fake news, but saving that for Facebook posts under my Russian alias. I have been taking the Dr’s direction to eat well while I can to heart. I had been losing weight slowly, mainly due to anxiety…I get hungry but then quickly lose all appetite a few bites in. Having Tuesday’s procedure changed from tracheotomy to biopsy has done wonders for the anxiety. That and having a plan of action. Ultimate outcome is still just as uncertain as it has ever been, but knowing the next steps helps to keep my mind on the nearer horizons and not worry as much about what is on the other side of the mountain. So, I have been eating. Breakfast (which I almost never eat), Lunch, and Dinner. Last night in addition to my main entree I had soup and dessert. Doctors said weight gain trumps pancreas for now (but not to go crazy with the sugar…just not to worry about it too much for now). As the below chart shows, it is having some effect. Difficult to tell without scale, but the far left of the graph is late June. The last green down arrow is last Wednesday and marks my weight’s low point (162.3 lbs). Today that is up to 165.8 (before breakfast of oatmeal and a Pumpkin Spice Latte). My throat soreness from the biopsy has almost entirely abated. But, that never really affected my eating…mainly it hurts only when I cough or “dry swallow” (i.e. swallow only saliva w/no other food or liquid volume). So, that is the no-update update for Saturday. I don’t really expect much to report until I go to the dental oncologist and speech therapist (for swallow coaching) later in the week. Ready for a relaxing weekend. Ok, just got my treatment schedule. I misunderstood the chemo part…it is more often than I thought. Starting 10/2, Chemo every Monday for 6 weeks (with labs it will take 4-5 hours); Radiation every week day for 7 weeks (30-45 minutes per session). I could list the possible side affects of the chemo, but just doing so would actually trigger some of those side affects. In any event, the side affects I actually get are the only ones that will matter, and no one knows what those are until they actually happen. They’ll be what they’ll be and I’ve got plenty of drugs to ease whatever they are. And, whatever they are can’t be worse than what this is going to cure. So, I’ll try to aim for more cheese and less whine. Well, several other people were feeling down in my mouth, today. First stop of the morning was a Dental Oncologist in Garland (about a 1 1/2 hour drive in this morning’s rainy rush hour traffic). Basically had to sign off on my teeth being healthy enough for me to start radiation therapy. Also, needed to have a tray made for a fluoride treatment to provide extra fluoridation to help counter any negative affects the radiation could have on my teeth. So, about 20 X-rays and a consult ensued, followed by a tooth casting so that the fluoride trays could be made. The radiation oncologist didn’t really feel that I would have to worry too much about my teeth, as the treatment will be much lower on my throat than some other cancer patients. But, I am all for an abundance of caution. The dentist gave me a thumbs up (after having various people in the practice having put their thumbs…and several fingers…in) but recommended I move up my November cleaning appointment to be as soon as possible. The office staff was great (oh, they are www.dentaloncology.com). They even helped out getting me an appointment for dental prophylaxis (look it up) with my regular dentist for this afternoon. So, I left Garland with a bag of goodies (2 toothbrushes, industrial strength fluoride gel, mouth moisturizing samples) and headed the 46 miles west back to my regular dentist. Got there early enough to grab lunch and do some email (some semblance of work, today, anyway). Office staff at my regular dentist — and by regular I mean every 6 months since 1988 — got me squeezed into the afternoon schedule. Oh, and that isn’t a typo; I’ve really been seeing the same dentist (and hygienist) for nearly 30 years. When I first started going there (after my previous dentist was arrested…but that is an entirely different tale involving women, nitrous oxide, and after-hours “dates” in the office) I had hair, my dentist didn’t have grey hair, and the hygienist was single. Fast forward, I’ve been going there through my own alopecia, the dentist’s development of canities, and the hygienists birth of a daughter who is now grown and long ago released to the wild. The entire office staff was great (if you are in Fort Worth and need a dentist: www.johnrubindds.com . Got teeth cleaned, a complete review of every tooth’s history and condition, then another bag of goodies (toothbrush, toothpaste, floss, some more mouth moisturizer). Oh, and Dr. Rubin: I was just joking. This wasn’t actually caused by floss poisoning.